The fact that your site had one brief post about the Boston Bombing, offering absolutely no commentary is a microcosm of what Deadspin has become. And that is a group of writers pushing an agenda instead of covering the news, and SPORTS which Deadspin used to make mention of. God forbid you condemn this terrorist as the scum he is. If your writers are worried about being PC or insulting all of the “good Muslims out there” (which there are plenty of good, I’m not disputing this) how do you explain your recent explosion of editorials covering race, police relations, and sexuality? Nobody at Deadspin is afraid to offer up OPINIONS strongly defending what you think is right. These thoughts are offered without regard of offending white folks (we are all racist), police officers and their families, and Christians whose beliefs on homosexuality differs from your own. Deadspin used to be an excellent blend of pop culture commentary mixed with sports. The site was, by far, my favorite. Now it seems to have become a political platform. I understand business, so leveraging polarizing stories, and offering nothing but strongly worded one sided opinion makes for increased readership. People who oppose your thoughts will read so they can shake their head and add their thoughts to the debate, and folks that agree with these thoughts will read and continue to read because the writers are like minded to them. Clearly this is why Fox News and MSNBC are able to thrive. With the writers at this site offering unapologetically and strong opinions on a variety of topics, making no mention of the impact of the Boston Bombing and the impact it had as a whole on our country just doesn’t make sense. To me, it comes off that your company is, for lack of a better term, self deprecating American apologists. Just think of the coverage your site would offer up if there was a comparable situation relating to one of your hour button topics, please follow me here. A Christian man who opposes homosexuality decides to set off a bomb at a gay rights parade. Kills three, injures another 300. Seriously, think about how you would cover this. You would not simply make mention of the obvious outcome of the trial, there would be 10,000 word exposes condemning Christian beliefs in regards to homosexuality. You would offer up several links throughout your articles to similar reports on disgusting crimes driving home your point about how crazy these people are to go to these lengths. If you can tell me how a Muslim carrying out a bombing based on their beliefs and what they think is right (killing Americans) and my example above are different, please explain. If your organization wants to be a “real” news outlet there would have been some actual reporting on the Boston Bombing. Otherwise, you guys are no different from a generic Facebook page offering opinions and posting links to whatever the hot button, political flavor of the month may be. If you are going to cover the news, cover all the news. Otherwise, please return to pre-2013 and entertain me again!!!!! Allow us to sate our reader’s appetite for muscle-flexing with this response: Dzhokhar Tsarnaev is a bad person. His brother Tamerlan, who is now dead, was bad. What the two of them did was bad. The Deadspin Editorial Board condemns it. Further, while the Deadspin Editorial Board does not generally feel free to speak on behalf of religions adhered to by a quarter of the world’s population, it feels free, in this case, to say that all sane Muslims, which is to say nearly all Muslims, think that what Dzhokhar did is bad. Making bombs is bad. Hurting people is bad. Killing people is also bad. 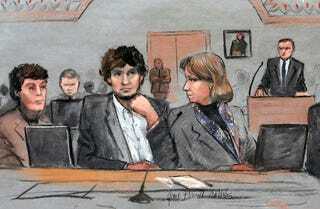 It is good that Dzhokhar Tsarnaev was found guilty of the bad things he did, because he is bad.